A cuddly Amur leopard toy. A factbook all about the Amur leopard along with bookmarks and stickers too. Two exclusive magazines: WWF’s ‘Wild World’ and ‘My Leopard’ with news and updates for your adopted animal. The amur leopard is a solitary creature that spends its time travelling about under the cover of darkness. They are highly skilled hunters who are athletic and quick on their feet when they are stealthily on the prowl. They can adapt to most habitats but prefer to live in forests. A large male can weigh up to a whopping 75kg! Amur leopard numbers are down to just 35 in the wild, making them one of the most endangered animals on the planet. This beautiful animal desperately needs our help before it’s too late. It’s a superb last-minute gift because the gift certificate can be printed or emailed immediately following payment. The female Amur leopard needs 50% more food when she has cubs. Amur leopards often eat their food in trees rather on the ground; this is mostly to make sure another animal doesn’t try and steal any! Amur leopards are skilful hunters, and they have longer legs than most other leopards as they hunt in all conditions, including snow. Between 1970 and 1983 they lost almost 80% of their territory due to human intervention. They breed in spring and early summer and can have up to four cubs at a time. Unfortunately breeding is hard due to the lack of numbers present in the wild. 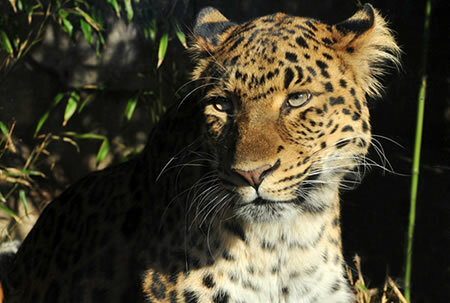 Please adopt me, I’m an Amur leopard and I am one of only 35 left on the planet. We are really close to extinction and are in desperate need of your help. We are hunted for our coats by poachers in Russia, who are also killing most of our food supply as well. As our habitat gets smaller and our food becomes more and more scarce, we are struggling to survive. Please adopt me today before it’s too late. Largely nocturnal and famed for their stealth, leopards are elusive, highly adaptable predators, and can run at speeds of up to 35 miles per hour. Although smaller in stature than tigers, lions and jaguars, leopards are able to tackle similar-sized prey to those species due to their huge skulls and powerful jaw muscles. After a two-year period where they are protected by their mother, and with the exception of brief periods during mating, leopards live a largely solitary existence. A typical day will involve long spells of rest during sunlight hours, followed by a period of hunting at night. When hunting for prey, which range in size from tiny dung beetles to large antelopes, the leopard makes use of its spotted coat for camouflage and relies upon its quickness of movement. Leopards exist in a range of climates, varying from deep snow to the intense heat of deserts. Generally, leopards will avoid human contact as much as possible, only attacking humans in the wild if they feel threatened, or if they are struggling to find regular alternative food sources. Less skilled at swimming than some of the other big cat species, they are, nonetheless, very much adept in the water and make use of their strong swimming ability to catch fish, which serve as a light snack. Although they rarely stay in the same area for more than two of three days at a time, leopards are very territorial. A leopard will announce its presence to other leopards with growls, roars and purring. Territory is marked with urine and sometimes claw marks on the ground. 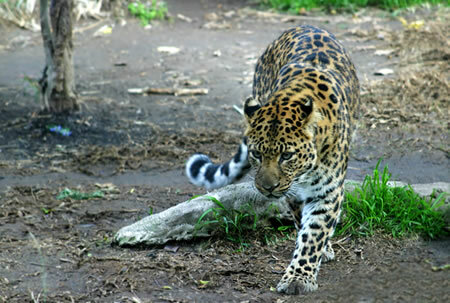 Male leopards tend to overlap their territory with the smaller boundaries inhabited by female leopards. For a leopard, mating is a relatively quick process, although it is not uncommon for the male to stay with the female for a few days afterwards, providing them with food and protection. Female leopards are approximately 20% smaller than their male counterparts and, because they do not have a set breeding period, are able to give birth all year long. A mother will hide her cubs for the first month or so, abandoning them to hunt. In addition to suckling them, she will also provide them with meat when they are old enough to consume it, generally after about eight weeks. I am the strongest of all the big cats! I am immensely strong. A fully-grown adult leopard, like me, is seven times as strong as a human being of the same weight. Using this strength, I am able to carry carcasses weighing as much as three times my own body weight. There have even been instances where I have carried the bodies of giraffes into trees! Although us leopards use our roar to warn off potential attackers, in addition, we can also purr, just like your own pet cat! When communicating with each other, we will often make a noise similar to a cough. We use this sound to alert other leopards to our presence. We leopards were kept as pets by at least two former Kings of England! Although today it is possible to adopt or sponsor a leopard, there have been many documented accounts of humans attempting to keep us as pets! A menagerie was established at the Tower of London in the 13th century and King John kept several leopards there. Henry III also had a fascination with my species, and was given three leopards by the Holy Roman Emperor, Frederick II, in 1935. The clouded leopard has the longest teeth of any living cat! Although my cousin, the clouded leopard, has a conical tooth rather than a sabre tooth canine morphology, in terms of appearance it is the closest living cat to the sabre-toothed tiger! The Amur leopard is endangered! Fewer than 35 of my kind exist in the wild. There are a further 176 captive in zoos across the globe, and conservation of my species relies on funding through members of the public choosing to adopt a leopard or sponsor a leopard. Leopard populations globally are diminishing caused predominantly by human over-population and the stresses this causes on the natural habitats that leopard’s call home. Poaching is perhaps the biggest of all the threats, as the fur of the leopard is extremely valuable, as are other souvenir items such as teeth and tails. In addition forest degradation is contributing to the leopard’s status as being endangered. The numbers of leopards in the world, especially in the wild, are quickly diminishing. Some subspecies of leopard are endangered to such an extent that they face the serious possibility of extinction in the near future; unless we make a serious effort to help. Perhaps the most frustrating thing about the plight of the leopard is the fact that many of factors causing their current status as a threatened species are human-induced. By choosing to sponsor a leopard you can assist in the efforts to protect this beautiful creature against such threats. Poaching is perhaps the biggest threat to their survival. At least 11 Amur Leopards are known to have been illegally killed since 2002, around a quarter of their wild population. Especially prevalent in Russia, leopards are mainly poached and their skin, as coats made of leopard fur are extremely valuable. Other parts of the leopard’s body, including teeth, tails and whiskers, are also sold on the black market for high prices and kept as souvenirs. Forest degradation has been another major factor in making leopards an endangered species. Man-made forest fires, often started to aid in the finding of scrap metals, destroy the leopard’s natural habitat, creating an unsuitable living environment. In addition, research suggests that leopards have a history of inbreeding, lasting for several generations. As a result, an increased risk of birth defects harms the survival chances of leopard cubs. 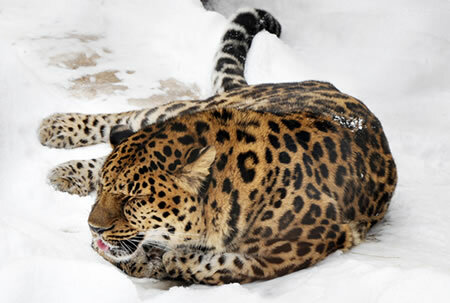 The population and distribution of the Amur leopard has been reduced to a fraction of its former size. It is estimated that 80% of its range was lost between 1970 and 1983. Today, the majority of Amur leopards live in the temperate forests of the Primorskii region of Russia − a 5,000 sq km area between Vladivostok and the Chinese border – with a few individuals living in the Jilin and Heiongjiang provinces of NE China, and possibly a few in North Korea. The Amur leopard, also known as the Far East Leopard or Manchurian Leopard, is listed as Critically Endangered in the International Union for Conservation of Nature’s Red List of Threatened Species. With only around 35 left in the wild, it is considered the world’s most endangered cat. The Amur leopard can be distinguished from other leopard subspecies by the widely spaced rosettes with thick borders on its coat. One of the most significant threats facing the Amur leopard is loss of its forest habitat due to logging, forest fires and the conversion of forest for agriculture. In addition, over-hunting of roe and sika deers, their main prey species, means Amur leopards sometimes have to seek out other prey to sustain themselves. Amur leopards will also eat small wild boars, hares and badgers but, in the absence of wild prey, they may venture into deer farms in search of food, sometimes resulting inleopards being shot by farmers protecting their livelihoods. Despite their Critically Endangered status, Amur leopards are still poached for their skins and for use of their bones in traditional Asian medicines. Agricultural land and villages surround their remaining forest habitat, making access relatively easy for poachers.